FK chat to Liz Jones about the evolution of her brand new shop, Gleaners Inc.
Tell us a bit about Gleaners Inc. and the concept behind it. Gleaners Inc. began as an idea I had with my friend Kerry Strauss. We wanted to get a collective of local creators together who embraced the three R’s – reduce, reuse, recycle, to promote and sell our work and maybe run workshops. The name Gleaners Inc. represented our idea. “Gleaners”: accumulators, collectors, gatherers. “Incorporated”: united or combined into a whole. Traditionally gleaners were people who gathered left over produce from harvests, but these days’ urban gleaners gather any type of discarded items to give them a new life. I found the perfect retail/studio space in Brunswick by chance about a month ago and decided to take it on. Brunswick has many warehouses and factories that have been converted into artist’s and muso’s studios. 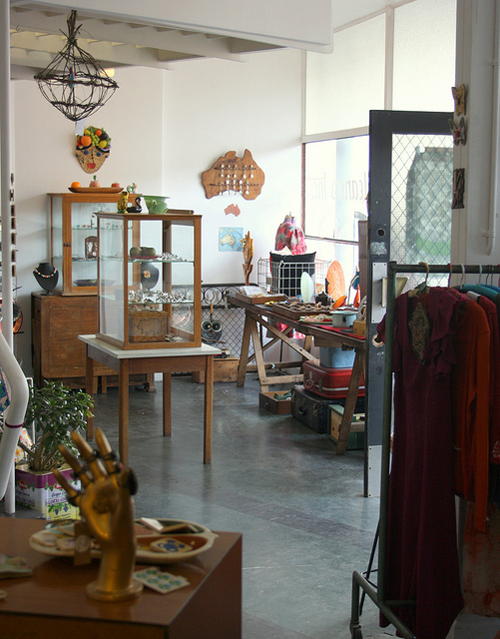 Gleaners Inc. is situated in the foyer area of the former Perucci Shirt factory which now houses “Gracious Space” studios. It’s quite unique. 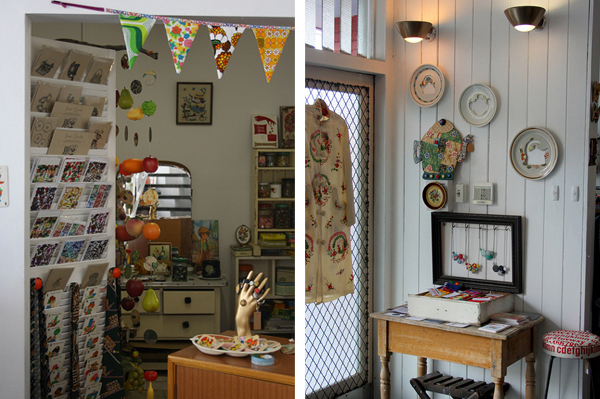 You don’t usually come across retail spaces in Brunswick that are housed in a 50’s era ex textile factory. 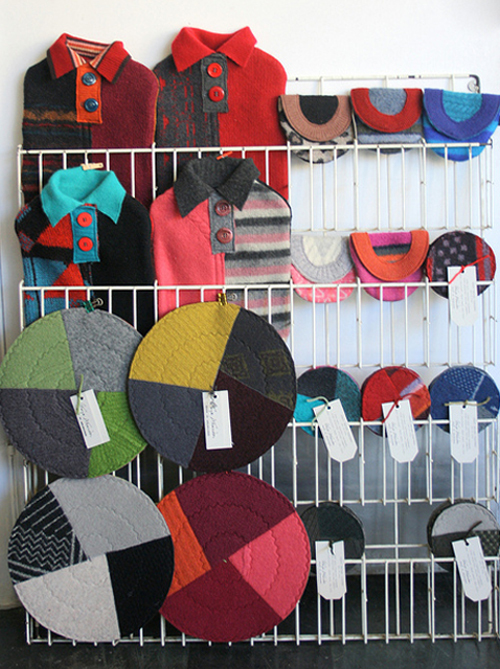 We then put the word out that we were looking for Australian designers whose work has a recycled or vintage aesthetic. As luck would have it, a great selection of fantastic, creative people have offered us their products and we have been able to fill up Gleaners Inc. with many beautiful and original things. You already have a successful label,what motivated you to go further and open Gleaners Inc? Betty Jo Designs is my jewellery and decorative home wares business. After almost seven years, I felt it was time to spread my wings and look at not only promoting my products , but also the work of other fantastic designers and crafts people that I admire and have met in my travels. I am still producing my jewellery, clocks and flying ducks in my studio attached to the shop, but now I also have the pleasure of being able to surround myself with other designers work and showcase them to the public. Labels we stock include jewellery and accessories by Greg Mann, The Cats Pyjamas, Each to Own, Red Peg Studio, Lucy Knol, Flown the Coup, Curlypops, Septembre Vintage, Sweet By and By, Shagpile, Erica Louise and Betty Jo. We have beautiful recycled glass ware by Luminous Glass, Recycled woollen home wares and pouches by Gaye Abandon, up cycled t-shirts and hand stitched pictures by Textile Allsorts, Willow bird cages by Squiggly Rainbow, Clutches and journals by Kitty Came Home, Cards and paper goods by Write to Me and Intrepid Duck. Also Re-sew-cool kits by Sister Outlaws, big and small assemblage owls by Focus on Art and hand cut vintage plates by Me Old China. This is only the beginning, so stay tuned to the HYPERLINK “gleanersinc.blogspot.com” blog for new designers and products arriving daily. 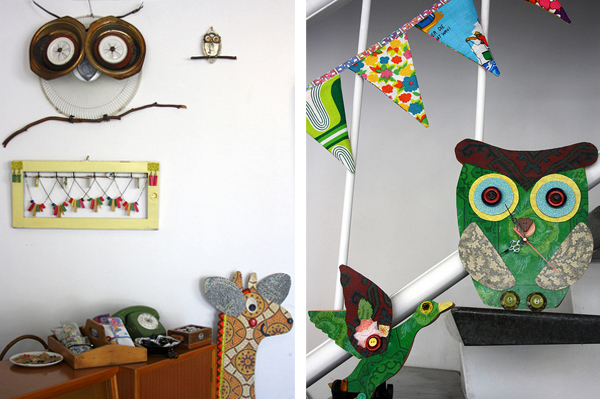 We are interested in stocking unique Australian handmade products that use recycled materials or are vintage in style. 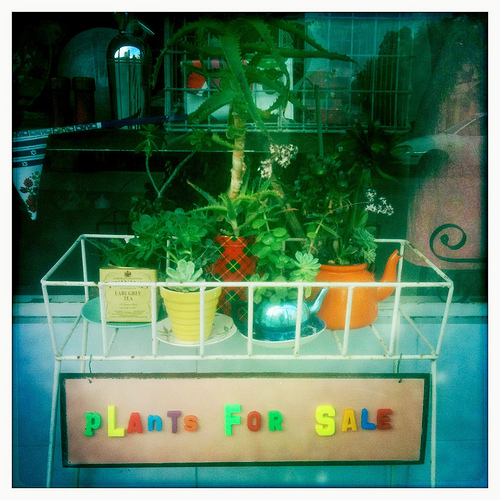 Gleaners Inc. also stocks quirky retro items, a great selection of vintage outfits and cute hand potted succulents. What is your favourite part about running your shop (so far!)? The best part of opening Gleaners Inc. has been meeting all the Brunswick locals and visitors who have been curious to see what was going to happen with the space and have been very supportive and positive. Yesterday I was chatting to a delightful elderly gentleman who has lived down the road for 50 years. It has also been great to have all these wonderful, creative people agree to stock their work in Gleaners Inc. and help us develop it into a lively colourful business. After working alone in my other studio for a year, I realised I missed regular human interaction, so I’m relishing the chance to talk to customers and friends and make connections. How do you balance the shop and your label, Betty Jo Designs? I am fortunate to have a studio space attached to the shop, so I can make Betty Jo goodies while I’m there (if I’m not busy being a shop girl). I think it’s an ideal situation as I know straight away the products I need to make to replenish the shop, and at the same time I can fill wholesale and online orders. If I was a customer , I would love to have a sneaky peek at an artists workspace and I’m happy for people to pop in and have a look, talk about my work and maybe remember Betty Jo if ever they come across some vintage lino. When you are not working, what else are you doing in Brunswick (VIC)? When I am not working I can fill a whole day in Brunswick visiting some of my favourite shops such as Pussycat Black, Olive Grove, and Mr Kitly. There’s op-shopping at Savers, Dom Bosco’s, or the Salvo’s, Coffee at Tre’, La Paloma’s or Ray’s and Middle Eastern treats at A1 bakery or Alayshas. What is the hardest part about a new start up business? There are many challenging things to master when starting up a business. Even if you have done some research or had previous experience, often it can be a voyage of discovery, and you can never predict how things will pan out financially, especially in this fickle climate. I am all about being flexible and evolving the business on several different levels to cater for the ups and downs of retail. The hours are long if you are doing it alone, and juggling kids, school pick ups and unforeseen hiccups are all going to be hurdles I’ll have to overcome. Luckily I have my friend Kerry from Luminous Glass helping out with shop duties and as a bonus; she is a whiz at book keeping. What plans do you have for Gleaners Inc. heading into the new year? Heading into the New Year, there may be some extra curricular activities on offer at Gleaners Inc. like workshops, exhibitions and special events like Pop Ups for guest designers. We would like to offer local artists the opportunity to design window displays or small sculptural installations. 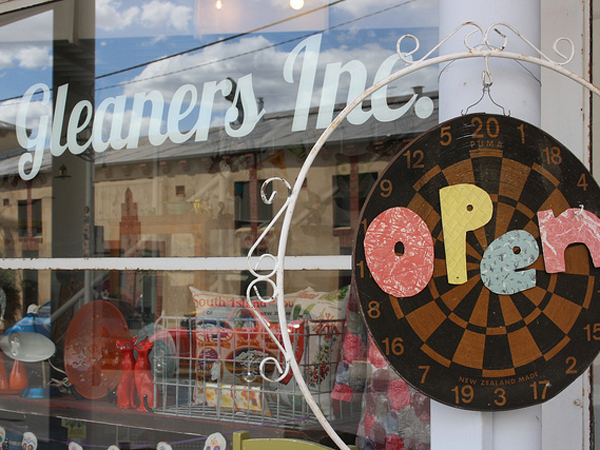 Gleaners Inc. and several other shops and café’s off the main drag of Sydney Road are getting together to produce a map for shoppers to help them discover the hidden gems of Brunswick. Other than this, we hope Gleaners Inc. thrives and grows. Fantastic to hear all of the background to Gleaner’s naissance. 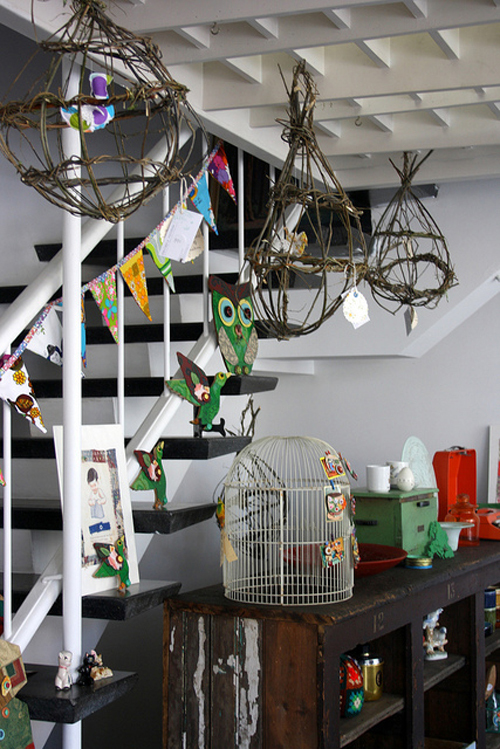 Love being a stockist and am thrilled that there’s such a great shop focused on repurposing so close by. Keep up the great work, Liz.